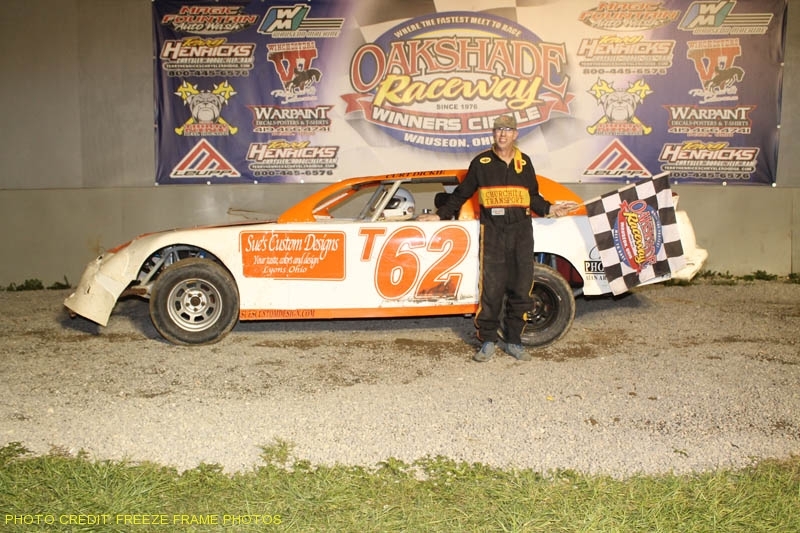 A heavy downpour stopped the Saturday night racing action at Oakshade Raceway prematurely, nine laps into the UMP Late Model feature. With threatening clouds looming over the area, track officials decided to skip intermission and bring out the UMP Late Model feature race instead. Devin Shiels took off into the lead from his pole starting position. After suffering more motor problems, Rusty Schlenk out of McClure, Ohio was in a car borrowed from Ken Hahn and driving hard. Schlenk took over the lead on lap four. Shiels continued to run second while the leaders began to lap some of the slower cars at the back of the field. A close call for Shiels ended up in a caution flag on lap nine. Shiels ducked low under a couple lapped cars and Troy Catterene didn’t realize Shiels was there. Catterene almost got into the side of Shiels, but corrected at the last second that resulted in him spinning into turn one to bring out the final caution of the night. That is when the rain began to increase and eventually became a wind driven downpour that put a damper on the rest of the night’s racing. The UMP Late Model feature will pick up where it left off with 16 laps remaining on Saturday, July 25 as part of the Sportsman Twin 25’s racing program. A regular night of racing for the UMP Late Models, Bombers and Compacts will also be part of that program that will feature two complete 25-lap features for the Sportsman class. The make-up features from the 7/18 rain out for the Sportsman, Bombers and Compacts will be determined at a future date.